Jewellery making is a brilliant hobby which includes some seriously fiddly work! You’re dealing with tiny pieces of jewellery, teeny beads and gemstones which can put a strain on your eyes and make jewellery making difficult. You probably spend hours at a time making jewellery, whether that’s silversmithing, beading or wire wrapping - so this could be a great helping hand for you. 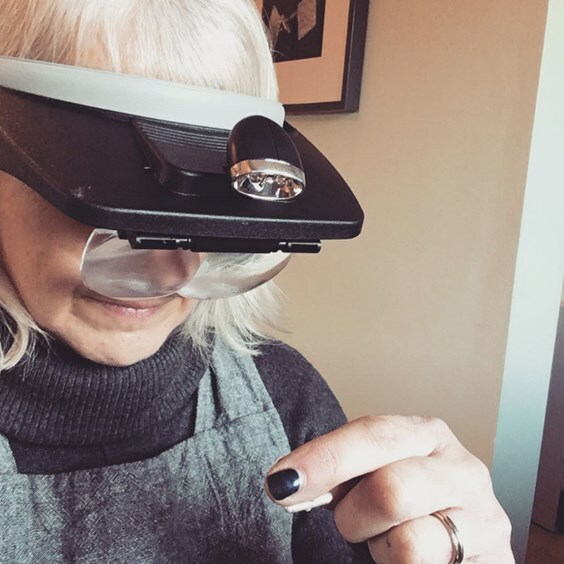 We want to share with you our recommended headband magnifier for jewellery making, a brilliant tool that helps your experience in the workshop. Image featuring our lovely customer, Claire Howard who couldn't be without the headband magnifier! Magnification not only makes it easier to work on a fiddly project, it also protects your eyes from straining which can make you tired. By having the headband magnifier, your eyes will be ready for a day in the workshop! By using the magnifier, you are more likely to spend longer working on projects as you will probably be more focused. Not only will you be helping your eyes, but you will also be making fewer mistakes so you can enjoy your jewellery making experience more. There are many magnification options available, including arms that you can place on your desk. The best thing about the headband magnifier is that it’s hand free and you don’t need worry about moving a magnifier around, it's simply there on your head when needed! 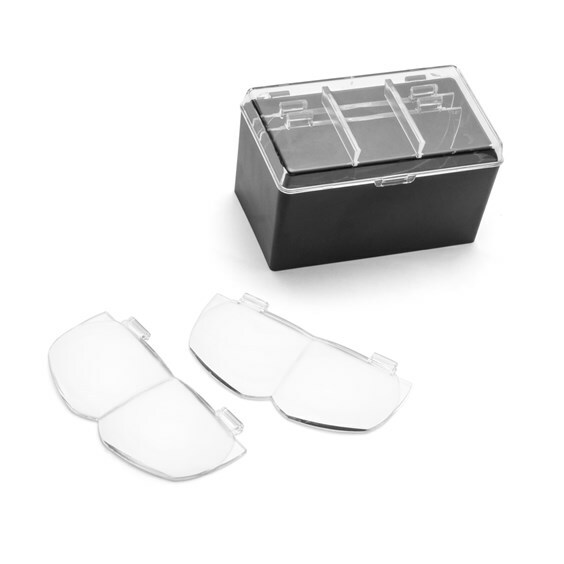 Our headband magnifier comes with four magnifying lenses, ranging from 1.2x to 3.5x. They slot in and out with ease, making it so simple and effortless to get on with the task you're in the middle of. If you have a better view of the piece you’re working on, you will also find that using a magnifier will improve the quality of your work and you are more likely to spot mistakes as you're working. This accuracy in settings and polishing will make your designs look so much more professional. By creating more accurate work, you will be finishing projects more quickly as you won't have to fix any mistakes you've made along the way! The magnifier will be taking out any guesswork, so you can speed through your makes and commissions. Having good lighting in your workspace is essential, you need maximum light especially if you work during the evenings. 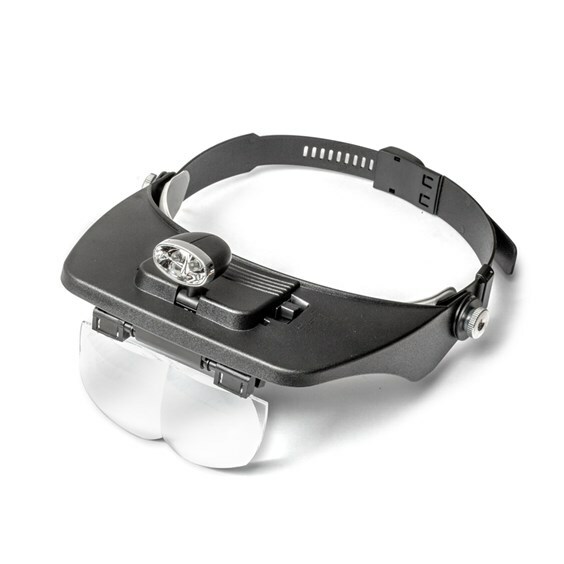 Many headband magnifiers come with an LED light attached to the headband. This is a brilliant addition, which can really help with seeing your piece of jewellery clearly and keep you focused at the workbench. One worry can be that the headband can be an uncomfortable fit but this is fully adjustable, suitable for different head sizes. It’s also so easy to hang up, so you can reach for it when you need it most. If you need to wear glasses while working on jewellery, you can easily wear them underneath your headband magnifier with little discomfort. Not just for jewellery making! If jewellery making isn't your only hobby and you enjoy sewing, needlecraft, painting, embroidery etc. the magnifier can be a perfect tool for all kinds of craftwork and household activities! A great all-rounder that we just couldn't be without.